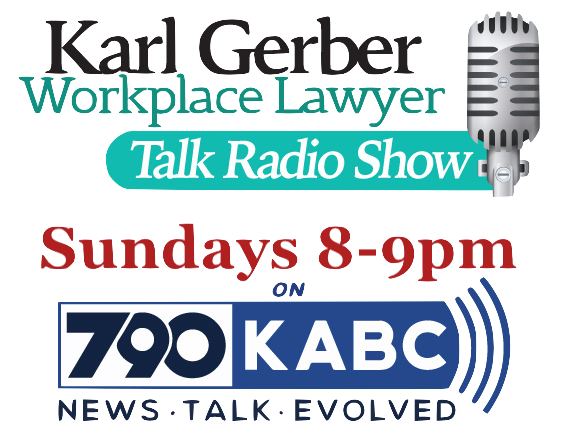 My name is Karl Gerber and I have a right to say that I am a Van Nuys Employment Lawyer. The story starts in 1949 when my mother moved to Sherman Oaks and attended Chandler Elementary School in Van Nuys, followed by Van Nuys Junior High School, Van Nuys High School (where my brother-in-law is a history teacher), and then Grant High School in Van Nuys. In 1977, when my father was either wrongfully terminated from Cal State Fullerton due to his political views, or his employment contract was not renewed because his two earlier dissertations were not accepted due to their revolutionary nature, my family moved to an area in Van Nuys that has since been renamed Sherman Oaks. I attended Chandler Elementary School in Van Nuys where I learned first-hand about discrimination. First, mandatory busing was instituted. Parents called the situation reversed discrimination because their children were being bused into Latino neighborhoods. From 1978 through approximately 1982, I experienced a form of discrimination called, “White flight.” All of the white kids left LAUSD for private schools. I soaked it up in fifth grade. I was the only white male in my Van Nuys class. There was one other white student in the class, a girl. For the first time in my life I was a minority beyond being just a religious minority, or the son of politically radical parents. I had heard of Black Like Me. My mother had spoken in no uncertain terms about how she was a Jewish freedom rider in the 1960s. In the early 1970s, my father, the radical political science professor, had named our family dog Malcolm after Malcolm X. I knew then that mission involved the end of discrimination. In fifth grade, I played a racist who wanted Rosa Parks off the bus in Chandler’s Rosa Parks Story. At age 10, my black teacher knew that I understood what discrimination was, and gave me the role. Word got out. The Los Angeles Times came to watch my performance. In 1981 I graduated from Chandler Elementary in Van Nuys. I went onto Millikan in Sherman Oaks. In 1984, I once again attended a Van Nuys learning institute when I started at Grant High School in Van Nuys. I was in honors and advanced placement classes at Grant High School. At the time the school segregated itself into Jewish cliques and Latino cliques. The few black students seemed cool. They were on the football team, or they were cheerleaders. One of my friends was a cheerleader. On the last day that I attended Grant High School there was a violent clash between the sudden Armenian students and the Latinos. Due to other interests such as the need to practice law, a burgeoning career as a fiction writer, my poor aptitude for math and science at the time, and a sense that there was nothing left for me to gain I transferred from Grant High School in Van Nuys to my girlfriend’s high school, Reseda. I attended Reseda High School for an entire school day. The circumstances surrounding the reasons for my transfer back to Grant High School in Van Nuys are hazy, at best, but the result was that LAUSD seemed to lose track of me. It might be myth, but rumor has it that my school records were lost. Instead of starting my senior year at Grant High School in Van Nuys, I seized the opportunity to enroll at Los Angeles Valley College in Van Nuys. I was sixteen and it was 1986. I used the job board at Los Angeles Valley College to find a job at Compex, in Van Nuys. For those of you who do not know, Compex is the leading Los Angeles company for copying medical records. Their clients are primarily lawyers. I recall only working at Compex a day or two a week. My job was to deliver medical records to lawyers in the San Fernando Valley. My route spanned from Mission Hills and Northridge to the north, Woodland Hills to the west, and Studio City/Universal City to the East. I dropped off medical records at literally every law office in the San Fernando Valley. Compex reorganized and decided my route was a full-time route. I justified that the decision to end my employment was not unjust termination because they knew I was a student and could not work full-time. From the Valley College job board, I found a job at a Van Nuys company that was an answering service. During my training I was informed that lawyer’s time was worth $150.00 per hour so I needed to be efficient when transmitting their messages to them. At the time, pagers did not have message capacity. The lawyer clients were paged and then they called in for their messages. My trainer was impressed that I could type at the same rate of speed in which the messages came in from a live person who spoke. The day I started I informed my supervisor at the Van Nuys answering service that I had a pre-planned trip to Disneyland so I could not work the upcoming weekend. He told me that I would have to cancel my trip because he could not bend rules. I choose Disneyland over the authoritative boss who I felt had mistreated me during my employment. Time passed and I had not received my pay. I called to complain that I was not paid my wages. Much later a paycheck for one day arrived. My next job from the Valley College job board was with a construction company in North Hollywood. I worked there until I was fired without cause. The reasons for the termination were hazy. In retrospect I do not think the company had enough work to justify my position. Still in the fall of 1986, I found my fourth job from the Valley College job board. To this day I cannot be sure what the purpose of this North Hollywood company was. For a day they had me move gigantic stacks of movie posters to various rooms in their office. I think the employment pretext was that I was supposed to be making room for my, or my group’s, workspace. All I can recall is a telephone conversation with my alleged manager wherein he told me that one of the other two people who spent their day moving around posters was going to be the lead, I was not selected. I tend to recall asking if I was supposed to come back to work, being given vague answers, and me never calling back to find out when. Needless to say, I was not paid for this job. Unlike the answering service that eventually paid me my wages after I pestered them, the North Hollywood outfit with the posters never paid me. By this time I was thoroughly discouraged with the at-will nature of employers, and in the case of the poster moving job I began to suspect that there were unethical employers out there who used false pretexts to get people to do work they would not be paid for. It could have been November of 1986 when I found my fifth job from the Valley College Job board, but I think it might have been earlier because I was sixteen when I started my life long career working in plaintiff’s law. This position was with Karl Seuth, Esq. in Studio City. He was a Valley College alumnus. Later I found out that he was a regarded as a legendary Los Angeles plaintiff’s lawyer. He hired me because he was impressed that I said I was a political science major and wanted to go to law school. I also recall a conversation about working for Compex. Karl Seuth’s office terminated my employment at some time before January 9, 1987. They claimed they had overextended themselves in their move to Studio City. By this time I felt used as an employee. It seemed that employees were little more than slaves. They had to do what their employers requested, and their employers had no qualms about getting rid of them at the drop of a hat. Employees lacked rights. Employment decisions seemed everything but fair. January 9, 1987, I landed my sixth and final job from the Valley College job board. This position was with Jay S. Rothman, a Professional Law Corporation. His ex-wife, who worked for the law firm as part of a divorce settlement, hired me. At the time, the law firm was in Encino, and yes they handled plaintiff cases. At some point when I attended CSUN, I observed one of their trials for a class. The trial was won. I worked at the operation until 1990, a few months into my law school education. It was there that I learned a lot about how to run a plaintiffs law firm. Clearly, it was at that law firm that I firmly decided that I would be a lawyer and represent plaintiffs. When I was done with law school, I came back to the firm as a law clerk and then worked as a lawyer there until approximately February of 1994. At the time the firm mostly handled personal injury cases, but they had a certain number of employment cases. The employment cases were complicated, employment law was evolving with new case law on a frequent basis, and so who else to put on those cases but the 23-24-year-old law clerk and then attorney. It was there that I learned what wrongful termination was in California, where I handled my first sexual harassment case, and learned the differences between tort damages for wrongful termination and breach of implied employment contracts in California. I also opposed my first demurrer in a case about fraud. In the summer of 1994, my parents sold their Van Nuys home that by that time was renamed Sherman Oaks. My parents fled the country, to Mexico, for about four months and then they moved back to Los Angeles. By this time I had formed a partnership with Stephen Danz who at the time lived in the Bay Area, and sometimes came to my Sherman Oaks office to help on an employment law case that I generated. Not until 1996 did he move to Los Angeles and we jointly rented an office on Van Nuys Boulevard and Ventura Boulevard prior to our purchase of the Sherman Oaks office building I am still in almost fifteen years later. During my early days of law practice, my employment cases were against Van Nuys manufacturing businesses. The businesses tended to be near the Van Nuys Airport, and yes they were aerospace employers. My clients were aerospace machinists and then in quality control. By 1996 I had successfully handled multiple aerospace whistle-blower cases. Let’s just say that once you have taken on those kinds of large employers in such complex employment litigation, against the big law firms, and won big, there is no going back. When I think about Van Nuys I think about where it all began for me. But as a San Fernando Valley historian, Van Nuys means so much more to me. Even more than the place where my mother went to junior high and was not allowed to walk past Bob’s Big Boy on Van Nuys Boulevard because the hoodlums hung out in front of there. I think of the largest land sale in history in which everybody with a telephone in 1911 was called, and given a free rail pass to Van Nuys. I think about Wednesday cruise night on Van Nuys Boulevard, probably the impetus for American Graffiti, Happy Days, and Mr. Lucas who by the way used a Van Nuys effects company for what made Star Wars more than a matinee science fiction flick. I think about Fedco in Van Nuys, Mad Man Muntz by the Van Nuys airport, the Airtel Plaza in Van Nuys where I rented an auditorium in 1996 to give a 6 P.M. and 8 P.M. sign-up speech to potential class members in my first employment class action that involved violations of the WARN ACT wherein a factory closed on less than 60 day notice and neither gave proper notice nor severance. But perhaps most important of all, at least to my legal career, was that on November 23, 1993 I found out that I passed the California State Bar on the first time, a month after I turned 24. I had clients waiting to retain my services. I read how I could get sworn in as a California attorney before the official swearing in ceremony my law school planned do in December. I learned that a clerk of the court could swear me in. So guess where I went? The Van Nuys Superior Court. It was there that a nameless clerk at the Van Nuys Superior Court gave me my oath to become a sworn member of the California Bar. Yes, I am a Van Nuys discrimination lawyer and a Van Nuys Employment Lawyer. I not only drank from, and grew from, the drinking fountains at my Van Nuys learning institutions, but I can tell you where the oldest sidewalk is in the Valley and that is in Van Nuys. Van Nuys is in my blood and will always be even if it has been renamed Valley Glen, Sherman Oaks, or Sherman Village.